Takes the reader on a dark and troubling journey over some rough, and likely unfamiliar, terrain. Just as Understanding the F-Word was an alternative look at twentieth-century American political history, Programmed to Kill is an alternative look at violent crime in twentieth-century America. This may seem, at first glance, like a radical departure from my previous books -- until one realizes that in this modern world that we inhabit, there is no discernible difference between crime and politics. If you aren't yet convinced of that, you might be after you finish reading this book. 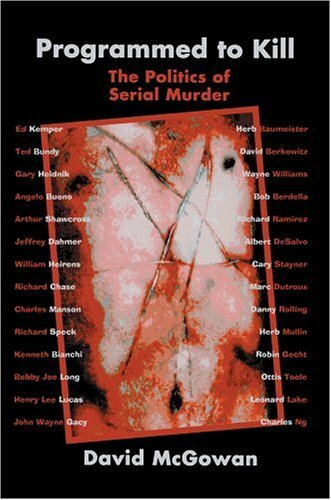 Programmed to Kill: The Politics of Serial Murder by Dave McGowan - is available in an Adobe e-book format for the low, low price of just $6.00. You can get it here: http://www.iuniverse.com/bookstore/book_detail.asp?isbn=0-595-77446-6. If that price is still a little too steep for you, you can browse through it for free here: http://books.iuniverse.com/viewgiftoc.asp?isbn=0595326404&page=1. "Not only could Bundy’s personality change at a moment’s notice, but his physical appearance could as well. Bundy had a chameleon-like ability to alter his appearance, an ability that is clearly displayed in the numerous photos of him that grace the pages of the various books he has inspired. An investigator on the Bundy case, Joe Aloi, claimed that he once observed Bundy react to a particularly stressful situation by spontaneously, and quite radically, altering his physical appearance; Ted’s body and muscle tone changed markedly, and he suddenly became sweaty and began emitting a noticeable odor.